Whether you're new to the workforce and just getting started on your retirement planning course, or you've been at it for a while, either contributing to your company-sponsored 401(k) plan, and/or making regular contributions to a traditional individual retirement account (IRA) through a private brokerage firm, I'd like to talk a bit today about the advantages of contributing to a Roth IRA. Unlike a traditional IRA, a Roth allows you to make penalty-free contribution withdrawals at any time, even before you reach retirement age. However, if you withdraw interest earnings or growth, there are penalties associated with this type of withdrawal. Now, I certainly don't recommend that you use your Roth IRA as an emergency fund, however, it is an available option, giving you some added flexibility that is not available with a traditional IRA or 401(k) account. As I mentioned earlier, you do indeed forgo tax deductions now when making Roth IRA contributions, however, this sacrifice now gives you a steady, tax-free income stream in your future. Depending on your age and when you plan to retire, this could be very beneficial—after all, who knows what the tax rate will be in 20 years? In addition, Roth IRAs can serve as effective estate planning tools. 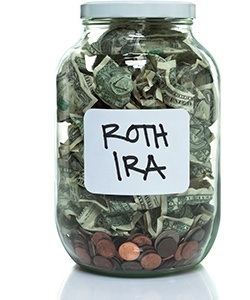 Unlike the traditional IRA, where you are required to make deductions at age 70 1/2, you are not required to make deductions from a Roth IRA at any time. So, in essence, you could leave any contributions and earnings in your Roth IRA, untouched, for as long as you wanted. Should you never have to make a withdraw, the money would continue to grow and earn interest and be available as tax-free income for your heirs. With a traditional IRA, at age 70 1/2, you are not allowed to make any additional contributions. However, a Roth IRA allows you to continue making contributions for as long as you'd like. If you continue to work well into your 70s and want to continue to save for your future or the future of your heirs, knock yourself out! There are several retirement planning options. The key is to find what will meet your current and future needs, and don't "set it and forget it." Take the time to meet with your financial advisor regularly to make sure you are on track and to reevaluate any changes in your income, expenses, and beneficiaries. How much will your retirement cost you? Click here to access our retirement planning calculator.